Janice (Jan) Parks Dreiling (’66, ’69 Overland Park) is a feminist lawyer and researcher, and an active member of the Women’s Studies community at Kansas State University. An alumna of Kansas State, she majored in sociology and minored in history. Jan Dreiling completed her B.A. and M.A. in Sociology at Kansas State and her J.D. at the University of Tulsa College of Law. She says that her study of sociology enabled her to understand society and people’s problems when she became a lawyer and a judge. Jan Dreiling retired from the bench in 2006. She now works as an attorney in private practice. KSU alumna Jan Dreiling is engaged in researching and writing a book on the 1867 campaign for women’s suffrage in Kansas. This campaign was led by a powerful group of women, including Clarina Howard Nichols. As she did her research, Jan Dreiling discovered more about the important role that the Wattle family played in the Moneka Woman’s Rights Association of Linn County. The Association hired Clarina Howard Nichols to go to the Wyandotte Constitutional Convention in 1859 so that she could work for women’s rights in Kansas. As she studied at K-State and served as a lawyer and judge, Jan became more appreciative of the importance of women’s rights. She realized that she wanted to “do something much bigger than me” and decided to combine her passion for researching women’s history and supporting women’s rights. One of the ways that she did this was to reach out to Women’s Studies at KSU and to support Women’s Studies students by creating a scholarship. Women’s Studies at Kansas State now has a new scholarship program for Women’s Studies majors because Jan Dreiling decided to express her dedication to gender equality and her commitment to Women’s Studies. Jan Dreiling started a scholarship program for majors in Women’s Studies. It is called the Clarina Howard Nichols Scholarship. This $1,000 scholarship is awarded at the end of each year to a promising major in Women’s Studies who has addressed major social or educational barriers or who has demonstrated an ability to apply academic knowledge to social change contexts. Because of her research on women who worked for suffrage in Kansas, Jan Dreiling asked that the Women’s Studies scholarship be named after Clarina Howard Nichols. Clarina Howard Nichols was an important 19th century feminist, who moved from the East coast to the Midwest and then to California. She took the lead in Kansas for supporting woman’s rights, including suffrage, when Kansas was becoming a free state in 1861. She played a key role in making sure that the Kansas constitution provided for women’s equal rights to education, women’s right to custody of their children, and married women’s right to acquire and possess property apart from their husbands. Partly with the political urging of Clarina Howard Nichols, participants in Kansas’ 1859 constitutional convention also considered her proposal that women be granted suffrage when Kansas became a state. Clarina Howard Nichols helped ensure that some rights for women were written into Kansas’ constitution. But suffrage supporters had to work a long time to get all women the right to vote. When Kansas entered the Union as a free state in 1861, delegates to the Wyandotte Convention had not given women the right to vote. Patriarchal control of government and elections kept women from voting in Kansas until 1912. At that time, Kansas became the eighth state where women were allowed to vote. It wouldn’t be until the passing of the 19th amendment in 1920 that women in every state were granted the right to vote. But southern states effectively disenfranchised many African-American women and men, keeping them from exercising their right to vote. Issues related to disenfranchisement continue to be discussed up to this day, especially as they relate to immigration and voter identification. Getting the rights of women addressed beginning in the1840s took serious leadership skills, courage, and a deep commitment to social equality, democracy, and social justice. Clarina Howard Nichols demonstrated that she had all this and more, and with increasing passion, as she took her children from an abusive husband in the 1840s, got authorization from the Vermont state legislature to divorce, married for a second time to a newspaper editor, found herself supporting the family on her own after her second husband died. She worked for the rest of her life as an advocate for woman suffrage, the rights of women, and temperance, forming close associations with famous suffragists like Susan B. Anthony. In May 2014, Women’s Studies was proud to offer the Clarina Howard Nichols Scholarship to the first recipient, Sabrina Flowers. We thank Jan Dreiling for making this, and so much more, possible. Thank you, Jan. In spring 2015, Jan Dreiling will talk about her research on women’s rights and the campaign for women’s suffrage at two Women’s Studies-sponsored events. She will, after a dinner, lecture on Thursday, March 5 (contact Kim Garver at kgarver@ksu.edu to make a reservation) and on Friday, March 6 at 10:30 am in the Hemisphere Room at KSU’s Hale Library (free and open to the public). For almost 30 years the Department of Women’s Studies has shaped the way K-State students learn and practice their professions. Women’s Studies has shaped education and community relations at K-State and in the State of Kansas. As a discipline, Women’s Studies is committed to researching and understanding women and gender; to addressing the injustices of gender, race, class and global hierarchies; and to bringing about structural and cultural social change that benefits everyone. As a Department in the College of Arts and Sciences, Women’s Studies offers both undergraduate and graduate programs, and all are interdisciplinary and university-wide. Women’s Studies has a major in Women’s Studies, a minor in Women’s Studies, and a Graduate Certificate in Women’s Studies. This year Women’s Studies started a Queer Studies minor, which also is an interdisciplinary, university-wide degree. Women’s Studies also impacts students who are enrolled at other institutions of higher learning. Women’s Studies has the potential to reach every undergrad and grad student in every discipline and program area in the College of Arts and Sciences, as well as to reach every undergrad and grad student in all the University’s colleges. The Department currently has seven full-time core Women’s Studies faculty, 1 grad student instructor, and over 50 affiliated faculty members from 18 disciplines, ranging from Horticulture to Modern Languages to Social Work. The affiliated faculty members teach courses that Women’s Studies students can count as electives towards their Women’s Studies or Queer Studies degrees; all these cross-listed courses have substantial course content that relates to Women’s Studies and its learning outcomes. Affiliated faculty members also participate in governance and planning for the interdisciplinary Women’s Studies program. Women’s Studies’ wide reach has enabled the Department to impact thousands of students, faculty members, the College, the University, and the communities that our land-grant university serves. In particular, we teach about 10 to 12 classes of “Introduction to Women’s Studies” every semester. Most of these “Intro” classes are taught in face-to-face classrooms during the day. Some classes are taught in the evenings and online via the University’s College that is known as the Global Campus. The face-to-face sections of “Introduction to Women’s Studies,” which offer General Education credits, typically have about 30 to 35 students. This class alone reaches over 600 students every year. Every semester we also offer about eight interdisciplinary Women’s Studies classes that are core curriculum classes and elective classes. For example, one required core class is “Feminist Thought”. Every semester we also offer a variety of interdisciplinary electives, which include courses like “African Feminisms,” “Latina’s Life Stories,” and “Women and Violence”. “Queer Studies: Concepts, History and Politics” will be offered for the first time in spring, 2015. Women’s Studies is an interdisciplinary department that connects academic study with community study. Most of our interdisciplinary and cross-listed classes involve students in the investigation of social issues and problems that impact the campus, communities, the U.S. and other countries, and the world. Some of our interdisciplinary and cross-listed classes engage students in analyzing possible solutions, developing new ways to address problems, and learning how to carry out solutions. Women’s Studies also offers an internship class to undergraduates and graduate students who want to have an extended, practical experience learning in a community-based, statewide, or global organization. This internship prepares students for the job market as it gives provides research skills that are needed for graduate-level academics and professional work. This year we are looking forward to engaging more KSU students and more community members in Women’s Studies. If you have any ideas about how to help us connect with more students and how we can work with more service organizations in the community, let us know. And please join us as we work to serve the people of Kansas! Women’s Studies held a graduation ceremony in April, 2014 for graduates and for students who have contributed to the Department. Here we’d like to extend congratulations to our spring 2014 majors: Kerre Allen, Marisol Gonzalez, Sonaya Hamza, Brittany Huffaker, Nichole Garrett, Marjorie McLaughlin, and Adena Weiser. And we congratulate our minors: Colby Bruner, Georgia Campbell, Courtney Carpenter, Kynsey Creel, Kaitlyn Dewell, Tonielle Fiscus, Jacob Handy, Stephanie Johnson, Abigail Kallenbach, Jessica Kampfe, Sara Krstolic, Courtney Langley, Trey McGrew-Bryant, Jessica Nguyen, Taylor Poindexter, Heather Smith, Jena Terlip, Taylor Williams. We’d also like to congratulate the students who completed their Graduate Certificates: Alicia Beeson, Kaylea Pallister, Andrea Parrish, Melisa Posey, Laura Thacker, and Brittany Wiles. Women’s Studies also thanks all individuals who have enabled Women’s Studies to serve Kansas State and the community in 2013-2014. 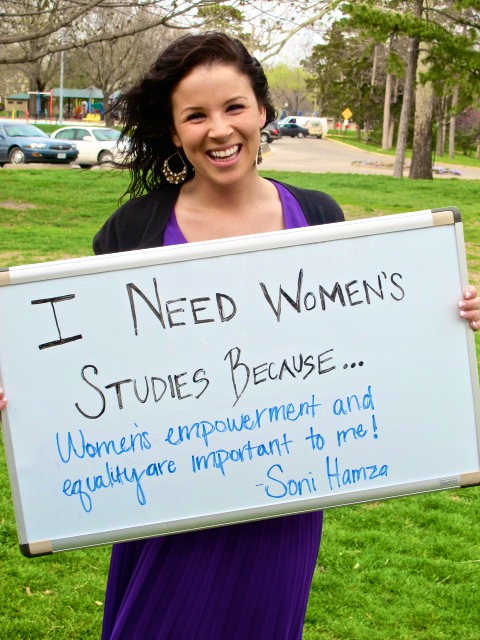 The Women’s Studies Ambassadors are students who represent the Department. We thank the Women’s Studies Ambassadors and all the students and faculty who worked on Ambassador events. This includes Sonaya Hamza, Mallorie McLaughlin, Olivia Parrish, Claire Tolentino, and Adena Weiser. For their support of Women’s Studies, we thank members of the Women’s Studies Advisory Board, including Dolly Anderson, Erin Bishop, Tremenda Dillon, Joyce Glasscock, Julie Hostetler, Angela Hubler, Nancy Knopp, Cathie Lavis, Kendra Lewison, Betty Mattingly, Madai Rivera, Stefani Schrader, and Noel Schulz. And we’d like to extend our thanks to KSU alumna Janice P. Dreiling, founder of the Women’s Studies Clarina Howard Nichols Scholarship. Women’s Studies congratulates the students who received Women’s Studies awards in spring, 2014. Mallorie McLaughlin received the award for the best undergraduate paper. Her paper was called “A Bearer Centered Model of Care and the Construction of Woman through Childbirth”. Laura Thacker received the award for the best graduate paper, which was entitled “Women Get Evil after Something Like That: Black Women’s Relationships in Gayl Jones’ Corregiadora“. The Founders Scholarship Award went to Maria Arvanitakis. And the first Clarina Howard Nichols Scholarship Award went to Sabrina Flowers. At the Women’s Studies graduation ceremony, faculty and students also recognized Dr. Shireen Roshanravan for her outstanding contribution to Women’s Studies over the last six years. Dr. Roshanravan received tenure and promotion to Associate Professor in spring 2014. Because of her strong commitment to studying race and ethnicity, Dr. Roshanravan decided to join the American Ethnic Studies Department, our sister program at K-State. We look forward to working with Dr. Shireen Roshanravan and to working more closely with the American Ethnic Studies Department. As a member of our affiliated faculty, Dr. Roshanravan will continue to serve as an integral member of the Women’s Studies faculty. Summer is a time for faculty to dive into new research and to see the world through new eyes. Valerie Padilla Carroll, Women’s Studies newest tenure-track Assistant Professor, is someone to follow when she does her summer research. Because she has been an instructor in Women’s Studies for many years, Dr. Padilla Carroll is an experienced and popular teacher who is well known for her courses on “Gender, Environment, and Justice” and “Women and Pop Culture”, which require ongoing research and critical inquiry throughout the year. As an active researcher and committed teacher, Dr. Padilla Carroll is proud of Women’s Studies solid program. She hopes to contribute to it by promoting students’ media literacy, by creating more engaging Women’s Studies courses for first- and second-year students, and by enhancing her classes with new knowledge generated from her research. Dr. Padilla Carroll believes that Women’s Studies scholarship is some of the most important but often least recognized work in our society. She is proud of the department’s social justice mission and she values the fulfillment that comes with doing engaged and socially relevant research and teaching at K-State. 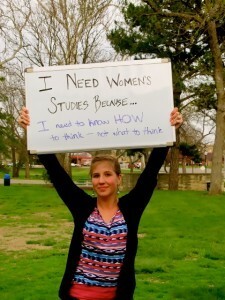 In her view, the Women’s Studies Department has awesome people and its students are amazing. “I’m continually impressed by how dedicated our majors and minors are,” she said. To develop the skills that students need to accomplish their life goals, Dr. Padilla Carroll helps students learn how to evaluate ideas and data by sharing her own research experiences with them. 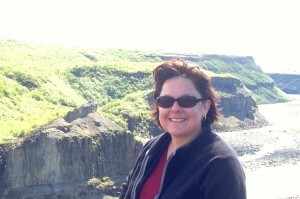 Dr. Padilla Carroll’s enthusiasm for Women’s Studies partly comes through her feminist research on environmentalism. In mid-June she came back from a short trip to Iceland, where she traveled to Solheimer, a 100-person eco-village in central Iceland that displays socially inclusive, environmental innovation at every juncture. While in Iceland, Dr. Padilla Carroll engaged in hands-on, participatory research as she traveled to different environmental projects. In Iceland, a small country of over 300,000 people, everyone relies on geo-thermal heating, which comes from hot springs generated by volcanic activity. “Everyone is hyper-aware of the environment because you’re in a volcanic area with hot springs and mud pots,” which is much like the geo-thermal activity in Yellowstone, Dr. Padilla Carroll explained. Iceland has an established bathing culture, even though it may be necessary to wear a coat when walking on the beach. “I even got to go in water where the glacial melt and hot springs merged, so I could choose where I got in the water and how hot or cool I wanted it to be.” Moreover, she said, “I’ve never felt more comfortable anywhere.” Iceland’s inclusive feeling and its environmental inventiveness have given Dr. Padilla Carroll the idea of exploring the possibility of taking students there for an academic trip. In July 2014 Dr. Padilla Carroll traveled to the East Coast to gather primary data at two archives that disclose part of the history of the “back to the land” movement in the United States. The $10,000 grant for this research came from the competitive Faculty Enhancement Program established by the College of Arts and Sciences. Dr. Padilla Carroll argues that this U.S. “back to the land” movement began as a white middle-class masculine project in the 1920s. At the University of New Hampshire, she looked at the collection on Ralph Borsodi, who helped define this “back to the land” movement. A vital part of this collection documents the “back to the land” work done by Myrtle Mae Borsodi. This portion of the collection illuminates women’s leadership in the movement. Men who advocated for a return to the land assumed that white middle-class households had enough money and resources to buy, maintain, and rely on the land for at least some food crops and sustenance. One of these vital resources was women’s labor, which was taken for granted and remained invisible to men who created the “back to the land” ideology. An analysis of the Borsodi archival materials, Dr. Padilla Carroll believes, will help demonstrate that men in this ideological movement relied on women’s invisible work for growing, canning, and transforming food, as well as for doing other domestic and field work related to household maintenance. As part of her summer research on the “back to the land” movement, Dr. Padilla Carroll also did archival research in Concord by studying the Helen Nearing papers in the Thoreau Collection. 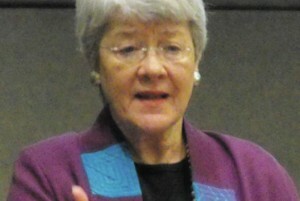 Helen Nearing has been idealized as the “mother” of this movement. And researcher Dr. Padilla Carroll will investigate the ways in which Helen Nearing’s activism and writings reflected, cultivated and/or challenged the white middle-class masculine “back to the land” movement. As a result of her recent scholarship, Dr. Padilla Carroll’s summer research already has made the 2014-2015 year a more exciting one for all of us. In fall, 2014 the new minor Queer Studies was added to K-State’s curriculum. Initiated by and administered under Women’s Studies, Queer Studies is an interdisciplinary field that promotes an understanding of queer identities and queer theoretical lenses. It also helps recognize and and expands the conditions that promote social justice. Queer Studies looks at how personal experience and identity formations are shaped by intersections of race, gender, sexuality, ability, nation, and institutional power structures. Queer Studies is a 15-credit hour minor that has one required course, WOMST 325 Queer Studies: Concepts, History and Politics. Four additional courses can be chosen from a list of approved electives offered by Women’s Studies and many Arts and Sciences departments. Women’s Studies majors and minors can count one of their elective courses towards both the Queer Studies minor and a Women’s Studies degree. Hello, Women’s Studies community! My name is Tom Sarmiento, and I am delighted to be a Visiting Lecturer in Women’s Studies this year. I recently completed my PhD in American Studies with a Minor in Feminist and Critical Sexuality Studies from the University of Minnesota in July 2014. I am currently working on my first book manuscript The Heartland of Empire: Queer Filipina/o Reimaginings of the Midwest, which revises my dissertation research. Analyzing popular cultural, literary, dramatic, and televisual representations of Filipinas/os—the second largest Asian ethnic group in the US and once formally colonized by the US—rooted in and routed through the Midwest, I problematize the Midwest as a place popularly imagined as devoid of imperial legacies, people of color, and queer people to produce alternative visions of region, nation, and diaspora. This fall, I am teaching two sections of Introduction to Women’s Studies, one of which is completely online, and The QueerAsian Midwest, a topics course based on my research and which counts toward the Queer Studies Minor. In the spring, I shall teach another section of Introduction to Women’s Studies, Women of Color Feminism, and Asian American Literatures, that latter of which will also count toward the Queer Studies Minor. I have enjoyed helping students discover the power of critical race, feminist, and queer scholarship and witnessing their “coming to” radical social transformation even more so. My Intro students are currently reading Gaga Feminism by Jack Halberstam, and I love how they are able to draw connections between popular culture and their lived experience to unsettle the gender and sexual norms that discipline us, yet do not actually reflect reality. Likewise, my QueerAsian Midwest students and I have had great conversations that challenge the place we call home; our vision of Kansas is not quite the dull gray of Dorothy’s. As someone who writes about Filipino writer Bienvenido Santos and his tenure as Distinguished Writer in Residence at Wichita State University during the 1970s and early 1980s, I find teaching and living in Kansas only fitting.